The communities of L’Arche and Taize have influenced the author’s insights and practices that encourage healthy family environments and the nurture of children’s spirituality. “Let the little children come to me, and do not stop them: for it is to such as these that the kingdom of heaven belongs.” – Matthew 19:14. 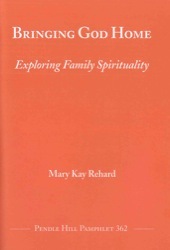 May Kay Rehard wrote her Pendle Hill pamphlet out of her experience as the parent of two children. She taught them at home, and also taught part-time at a community technical college. A member of West Richmond Friends Meeting (Richmond, Indiana-FUM), she served on the advisory committee for Richmond Young Friends, a ministry shared by three local Friends meetings for youth grades 6-12. In addition, she was part of a Children’s Worship team at West Richmond Friends, providing special worship, community building and intergenerational experiences for children in the meeting. She enjoyed singing in the meeting’s choir and bringing the songs and prayers of Taize to the Earlham College campus and local youth groups. Her Pendle Hill pamphlet began with her family’s visit to the Taize community during Holy Week 2000, with the help of her home meeting and a grant administered by Friends World Committee for Consultation from the Elizabeth Ann Bogert Fund (see “Drinking the Living Water: Pilgrimage to Taize,” Friends Journal, October 2001). In January 2002, Mary Kay and her husband, Patrick Nugent, took a group of students and faculty to the annual mid-winter Pilgrimage of Trust meeting organized by the Taize community. The meeting was in Budapest, and they were 10 Americans among 70,000 young adults from Europe and other continents. Mary Kay’s family moved to Africa in 2002. She and Patrick were appointed by Friends United Meeting to share the position of principal at Friends Theological College in Kaimosi, situated in the western highlands of Kenya near Lake Victoria. The college, founded by Quakers in 1942, prepares East Africans for pastoral ministry and other leadership roles.